Following a rain delay last weekend the Scottish leagues' speed towards their conclusion and five Hillhead sides are in action on Saturday. It's also been an exciting week off the pitch as Hillhead Men and Ladies hockey clubs have been recognised by LEAP Sports Scotland as an LGBT Inclusive club, the first in Scotland! We are proudly committed to doing what we can to break down barriers to accessing, participating and excelling in sport. Make sure and read our Diversity and Equality Policy. Mark Ralph’s side were left disappointed as last weekend’s match was postponed due to poor weather but it is back to business in the race for the coveted 4th position and a chance to compete in the European playoffs. Grange have been in fine form all season, the Edinburgh side have the best defensive record in the league and have not yet lost a game. A win for Grange would see them secure the league title on home soil. A win for Hillhead could lift the Hornets back into the top 4 should Uddingston fail to take maximum points from Western Wildcats. When the two sides met back in November, Hillhead fell to a 3-1 defeat however the Glasgow side squandered a number of late chances that could have rescued a valuable point. 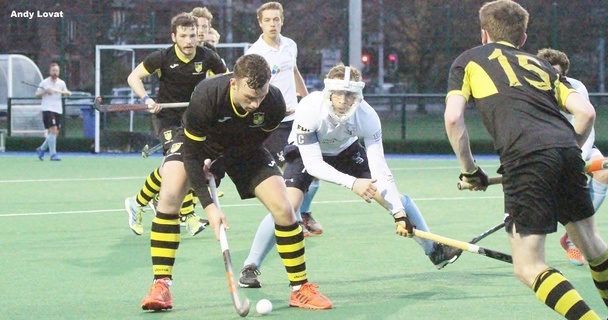 Hillhead will be looking to put in a resolute performance on Saturday and have numerous players in their ranks who can change matches when given the smallest opportunity. With the league title out of sight the 2s are looking to finish strongly and regain 2nd place in Regional 1. The match on Saturday against Grove Menzieshill 2s provides an excellent opportunity to make up lost ground on Grange 2s. Grove Menzieshill have struggled on the road this season and Hillhead will look to take advantage on Saturday afternoon. Chris Wilson will be looking to finish the season strongly with some goals and will be ably supported by player/coach Craig Hilton. There is no room to slip up for the 3s as they aim to secure the West District 1 title. Hillhead have done the hard work and overtaken Uddingston 2s and now the challenge is to stay there. Jonny Duke’s development side have made huge gains as the season has progressed and have been justly rewarded with their league position. Clydesdale 3s will be tricky opposition, the Titwood side have won eight and lost eight this season. The previous two meetings between the sides have seen each side secure a win each. The outcome of this match will decide who holds the bragging rights when the season draws to a close. The 4s now have a seven point lead in West 2 although 3rd placed Kelburne could close that gap should the Paisley side win their game in hand. The 4s welcome Rottenrow 2s to Anniesland having despatched them 9-0 at Glasgow Green back in November and Gordon Macintyre-Kemp will be hoping his side can repeat that feat. The 6s face Ayr 2s at 3.30pm, it looks set to be a cracking mid table clash and Lewis Campbells side will want to secure 3 points on home turf as the 2018/2019 season moves towards its conclusion.